Larval foodplant, Aristolochia pistolochia or A.rotunda? 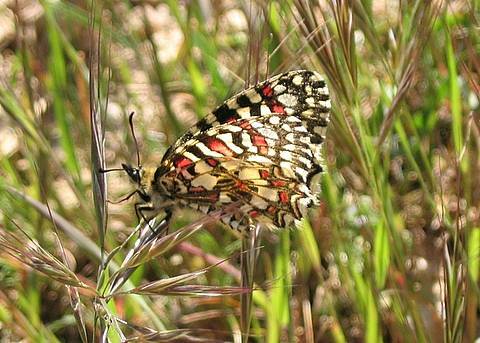 In relation to other European species festoons are really quite extraordinary looking butterflies. 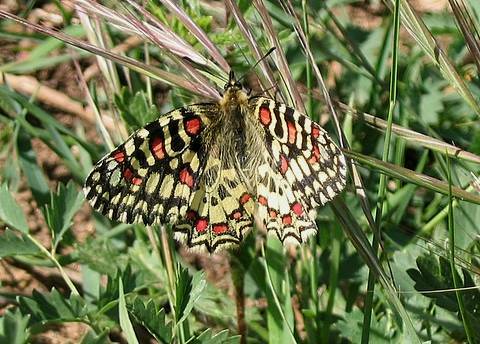 I hadn't a clue what sort of appearance and pattern of flight to expect but now that I've seen some I do believe that they exist at least! We have found strong colonies flying in the Var where it doesn't seem uncommon in suitable habitat areas. In flight the colouration comes over rather dull and greyish, probably a mixture of the pale yellow and black with the wing beats. Nothing at all 'white' about it anyway. 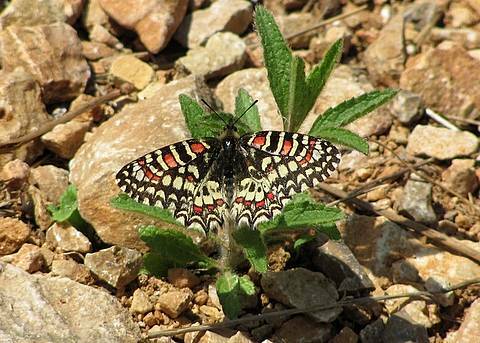 The flight pattern was rather a mixture......I found it a cross between Artogeia, Lasiommata and Melitaea which probably indicates I'm just a lunatic but at any rate it means it is recognisable as something different. 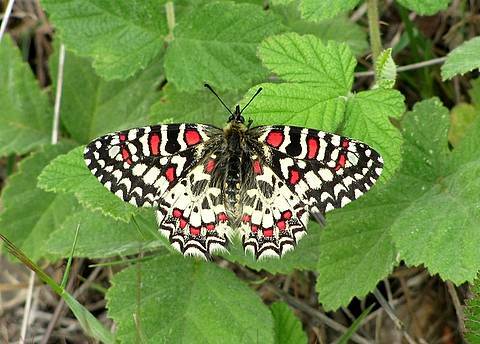 It can be seen from these pictures that the butterfly can be beautifully colourful, though we saw several with the forewings washed out, with the red markings barely detectable .... I'm not sure if this was simply linked to age though. 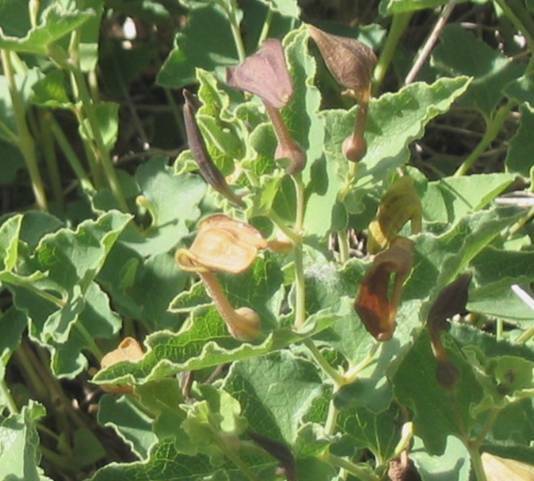 Females were laying on clumps of the distinctive larval foodplant Aristolochia sp. The flower heads look a bit like space aliens (!) with a swollen base, an upright 'neck' and a flat head on top. The leaves are rather triangular-heartshaped and wavy edged. 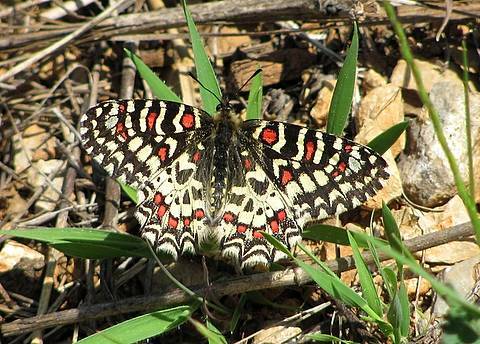 There is a similar species the Southern Festoon (Zerynthia polyxena) which also flies in the south of France though is more precocious. Nonetheless, when their flight periods overlap care must be taken to identify them correctly. 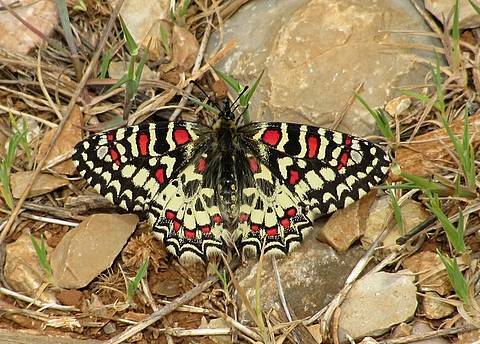 The red markings on the forewings of the Spanish Festoon are diagnostic....as long as they are apparent! 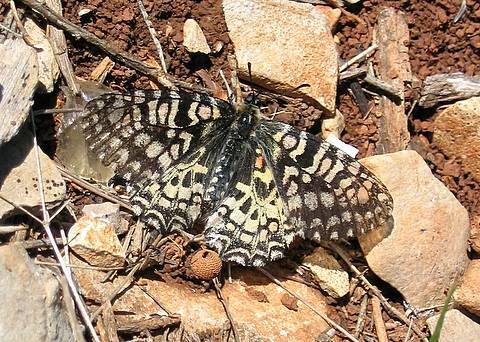 The 'loops' or 'festoons' around the edges of the wings are more deeply arched in Z.polyxena.